려욱과 루나가 출연하는 ‘하이스쿨뮤지컬’, 21일 1차 티켓박스가 오픈했다. ‘하이스쿨뮤지컬’은 16일 CJ E&M 뮤지컬 페이스북에서 “하이스쿨뮤지컬 드림업! 프로젝트가 시작된다!”는 글과 함께 트로이, 가브리엘라, 샤페이, 라이언의 포스터 촬영 비하인드를 공개했다. 7월2일부터 블루스퀘어 삼성카드홀에서 개막을 앞둔 ‘하이스쿨뮤지컬’은 오는 21일 오후 2시 전 예매처 인터파크, 예스24, 옥션를 통해 1차 티켓 예매를 시작한다. 31일까지 조기 예매시 30%의 할인 혜택을 제공한다. ‘하이스쿨 뮤지컬’은 동명의 영화를 원작으로 농구부 주장 트로이와 천재소녀 가브리엘라를 중심으로 꿈을 즐기는 청춘들의 풋풋한 사랑, 고민, 열정을 스타일리시한 음악과 에너지 넘치는 안무로 연출한 히트 뮤지컬이다. Ryu Wook - Roo Na appear ’High School Musical’, open first ticket on 21 ’High School Musical’ released the behind story of the poster shooting of TROY, GABRIELLA, SHARPEI, RYAN with the message "High School Musical Dream Up! 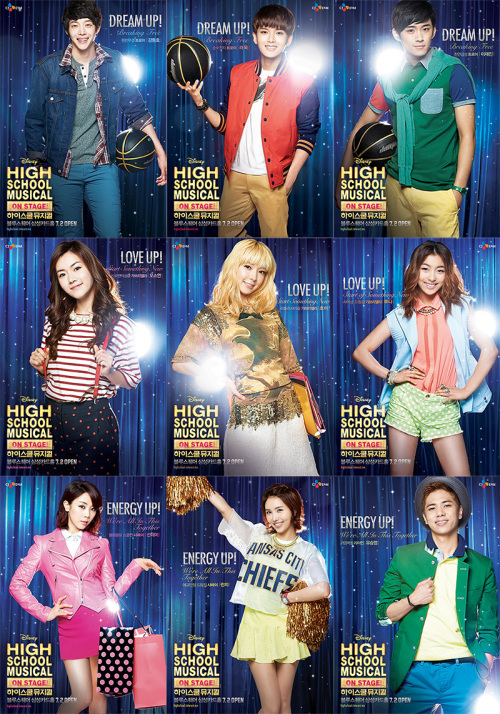 ’High School Musical’ will open at Blue square Samsung card Hall on July 2. Tickets are available at Interpark, Yes24, Auction firstly at 2 PM on May 21. It offers 30% discount to people who buy tickets early until 31. ’High School Musical’ is a remake of the same title of the original. A leader of the basketball team Troy and a genius girl Gabriella are the main characters. This is a hit musical with stylish music and energetic dance expressing fresh love, worry and passion of youth enjoying their dream.